First day of the Ministers meeting. A full agenda covering many environment charter commitments and international commitments with related sustainable development goals. Climate change and how the different jurisdictions are dealing with the same. It would appear that we are well ahead of the game in many respects with a proper climate change strategy in place and low carbon initiatives in progress. Afternoon session looking at the way forward. It would appear that many overseas territories unlike the crown dependencies rely on funding from both UK, EU and international sources. It was obvious that there was a big disparity between the way in which we focus on issues with internal funding. 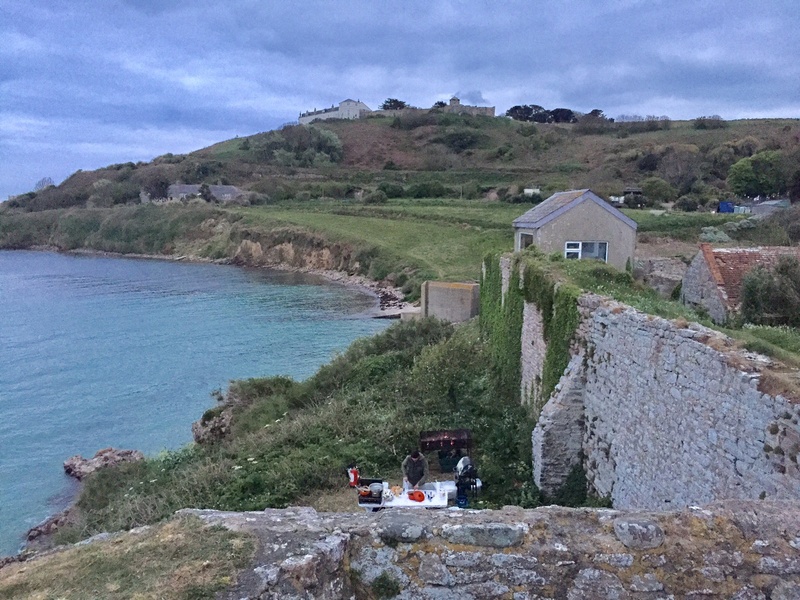 A case study on planning reform in Alderney which prompted some discussion was particularly relevant as we are at present starting a review of our own planning structure. Later session on Green Bonds and potential sources of funding, useful and informative. DEFA has a commitment to introduce energy saving initiatives by the end of this year. 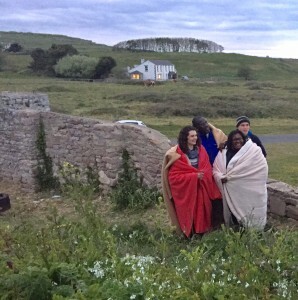 Evening BBQ at an old Roman fort ‘the nunnery’. 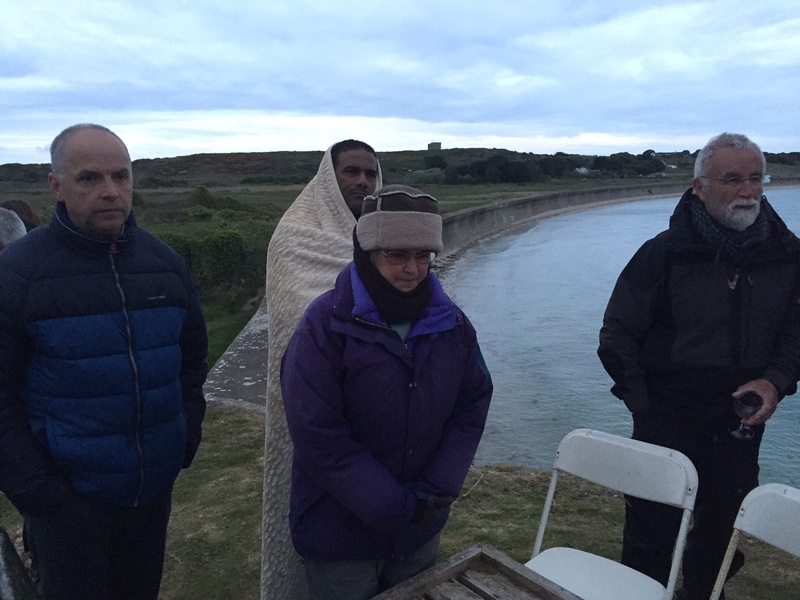 The pictures tell a story about how cold it was. The scenery however was stunning. This entry was posted in Uncategorised on 28th April 2017 by geoffreyboot.org. Morning – constituency morning and catch up. 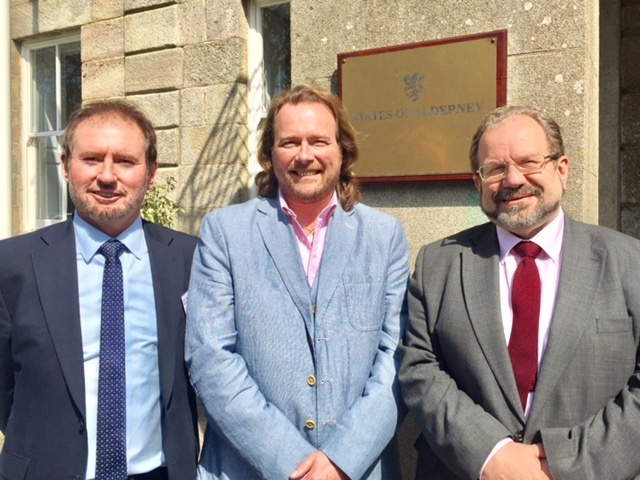 Lunchtime – to the airport for flight with my CEO to Alderney for the second meeting of Environment Ministers of the UK Overseas Territories and Crown Dependencies being held in Alderney. An unusually short order paper, 6 members absent all on government business, the court did feel somewhat empty. However this did not stop some robust debate particularly around delivering the Programme for Government although in the final analysis it was passed unanimously. There was some concern that the Programmes delivery is not ambitious enough but it is a plan and the document is a living and dynamic document to be reviewed annually in October, where there will be opportunities to examine outcomes and make meaningful alterations. I had one piece of legislation which was passed unanimously, the Housing (miscellaneous) Act 2011 which was an amendment to that Act which introduces new housing standard regulations for HMO’s. One member thought they weren’t tough enough but I did point out that these are minimum standards and many properties would be far better equipped. With registration now compulsory, we will in due course have a far better idea of standards of HMO’s around the Island. Back in harness after our Easter break. Amazing how much email traffic accumulate over 7 days, hopefully replied to everyone. Afternoon attended the Planning Committee Quarterly Review, a useful exercise exploring some of the more interesting applications that have been determined in the last quarter as well as talking about planning policy reform, a process that is well under way. This entry was posted in Uncategorised on 25th April 2017 by geoffreyboot.org. Proceeded by an early morning Council of Ministers meeting as we don’t want have one this Thursday. No questions for me in the Keys other questions of interest. A question for Economic Development around the suspension of work permits in the area of construction. 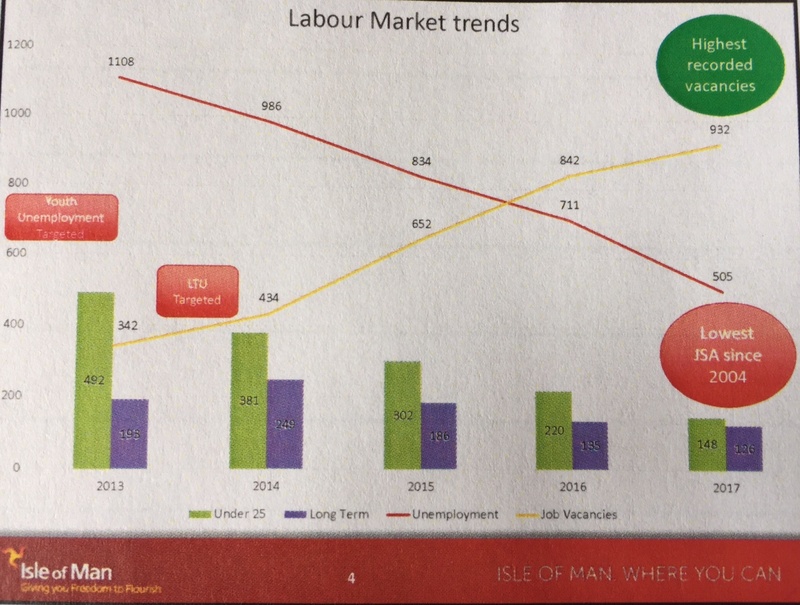 It was pointed out by the Minister there was no suspension as such just temporary exemptions in other words the tap can be turned on or off depending on the number of people unemployed or available for employment in the Isle of Man. Question for the Home Affairs it would appear that we will shortly have a fixed and portable camera for automatic number plate recognition on island and if successful these will be rolled out to more patrol cars. 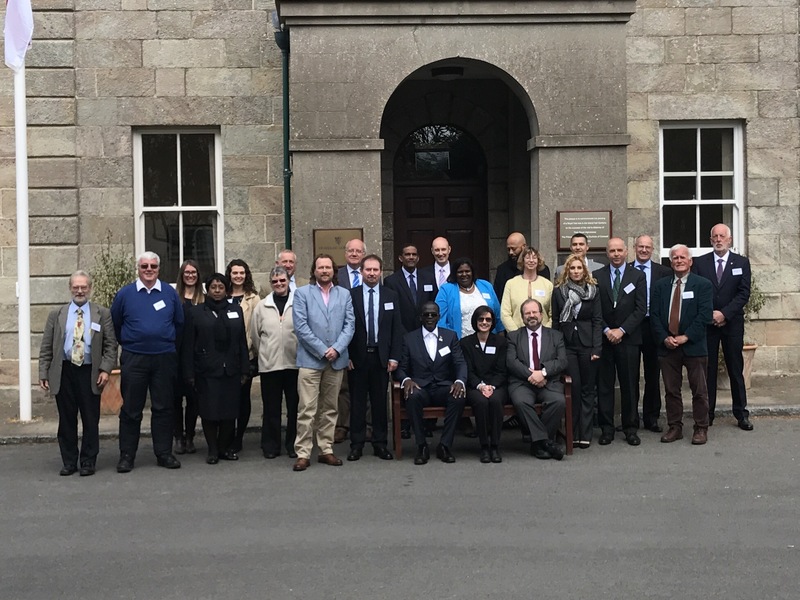 It is anticipated that this will improve enforcement of road tax and insurance, not only for on island vehicles but those registered in the UK. A question to the Minister of Infrastructure with regard to track purchased by Government dispelling the myth that track purchased for the promenade was to be used in King Edward Road, apparently 300 pieces of rail have been purchased for the promenade and 400 for the King Edward Road. Other business included first reading of the Casino (Amendment) Bill 2017 passed unopposed. After the sitting was complete we reconvened for an experimental run through the new voting procedures for the Legislative Council. 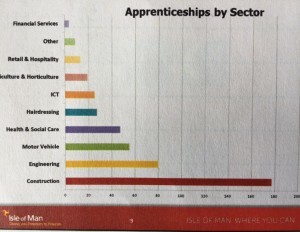 Lunchtime presentation by Department of Economic Development looking at the employment statistics and skill base. 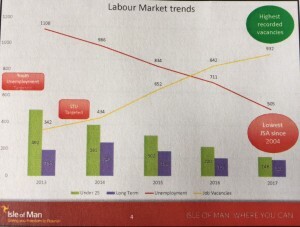 The graph below vividly indicates labour market trends and indicates why some easing of work permits restrictions are in order. 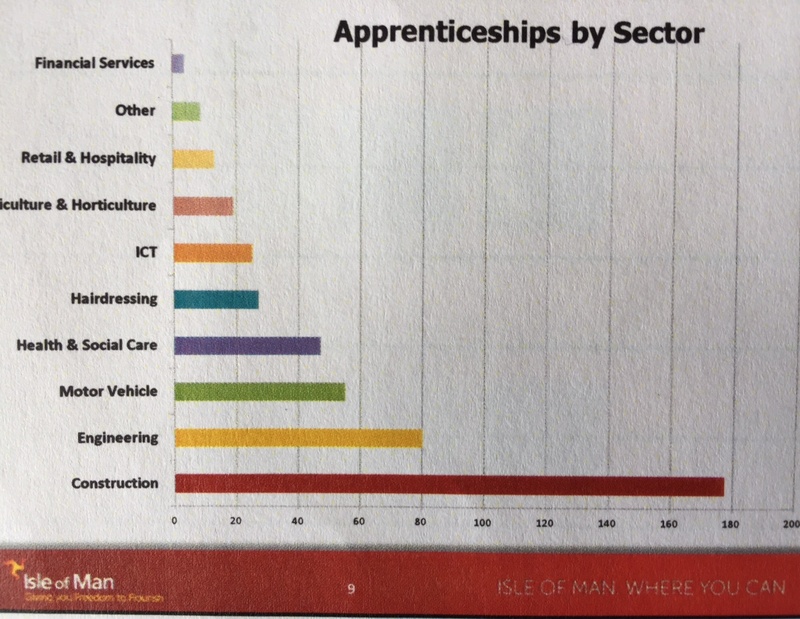 It was also interesting to hear how the number of apprenticeships on island is increasing year on year an effort to address skill shortages from the local labour force. Followed by members participation in the KPIs for the Programme for Government. We are now at the stage where the second tranche of the programme will be before Tynwald in May for debate and final sign off by members. I was pleased to note the unanimity and the open approach continues to involve all members. 9am saw me at QEII School to present the fourth and final tranche of coins and stamps celebrating the 150th anniversary of the first general elections of the House of Keys to years 7 & 8. Later morning a visit to the Peel Charity Shop for a donations coffee morning. What a great organisation, they have now raised over £1 million for local charities. As I had to leave early for a meeting in Douglas we left with some raffle tickets and latterly received an umbrella as a prize (something we haven’t needed for the last few days). Environment and Infrastructure meeting, this is a sub committee of the Council of Ministers which deliberates on policy. Meeting with Manx Telecom where we had a frank and open discussion about their strengths and weaknesses. This entry was posted in Uncategorised on 10th April 2017 by geoffreyboot.org. After the Isle of Man Post Office presentation last week I received a personalised MiCard which they are rolling out for people to collect social security, pension and benefit payments. 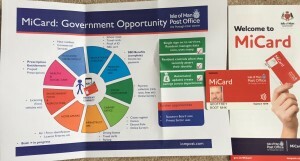 None of which I hasten to add I am claiming at present but also highlights the additional potential uses of the card. This entry was posted in Uncategorised on 7th April 2017 by geoffreyboot.org. Usual Thursday morning Council of Minister meeting, some fairly lengthy debates but finished by lunchtime. 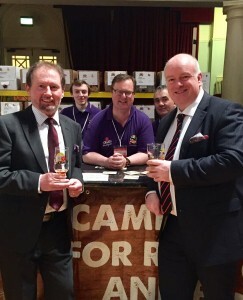 Lunchtime visit to the Isle of Man Beer and Cider Festival staged by CAMRA. 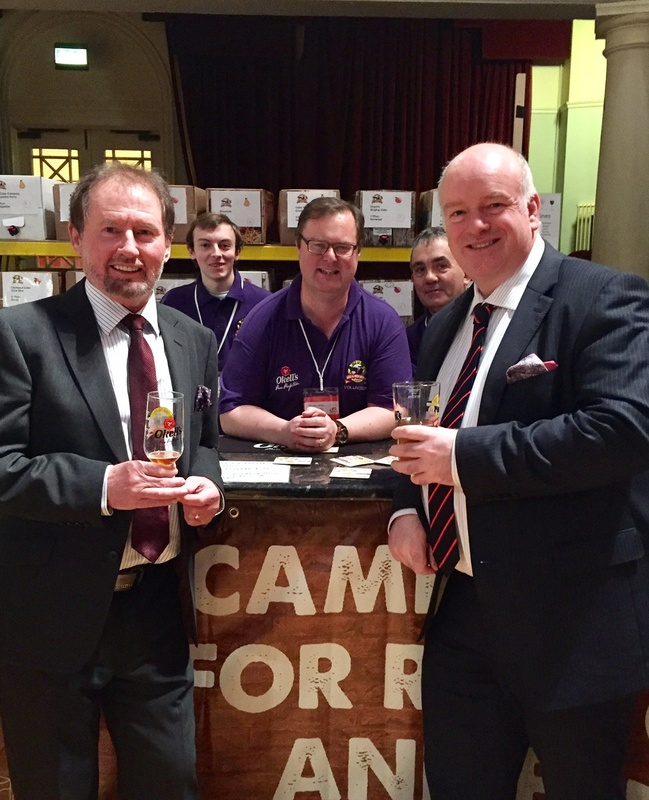 As the Chief Minister said in his Tweet, all this ministerial stuff is thirsty work! So a welcome break. The festival has grown over the last few years and I was amazed at the range of beers and ciders, a number of which are produced on island.